I'm going to type you a letter with it. Sometimes the comments on the post between mother and daughter are better than the post...You guys crack me up! First of all... do you want me to leave comments here regarding your (rare) typos instead of emailing you about them? Secondly... yes, I think I deserve a raise... at least double what I'm getting now. Um, no, let's keep those typo emails private. I'd like to keep up the pretense that I'm perfect. :) And just because you are so supportive and helpful, I'm going to TRIPLE your pay! How about that?!? Thanks for that font link, that was cool! love the font!! thank you! 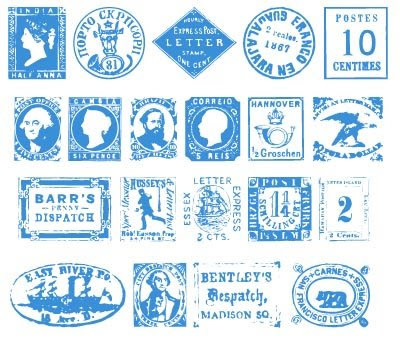 Love love love all things stamped and canceled! This is beautiful. Oh thanks for sharing the font...I love fonts. Oh, I get it. I had to google. Wonderful! Perfect and just what I've been looking for for a current project. You're a life saver!